A highly penetrating night cream enriched with Organic Coconut Water and Vitamin E to nourish and replenish skin while you sleep and Green Tea to help protect skin against pollution and free radical damage. [A’kin] products are free from sulfates, parabens, petrochemical cleansers, mineral oils, artificial colours & fragrances. [A’kin] uses the purest botanical ingredients and is formulated without animal ingredients or animal testing and are Vegan and Halal Certified. Apply every night to cleansed and toned skin. 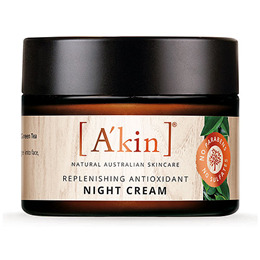 Below are reviews of A kin Replenishing Antioxidant Night Cream - 50ml by bodykind customers. If you have tried this product we'd love to hear what you think so please leave a review. I received the order and it was as advertised.